EasyJet has warned that customer demand for ticket sales for the next six months - which includes the peak summer season - is unexpectedly weak. The airline blamed uncertainty over the global economy and Brexit for the slowdown in forward bookings. 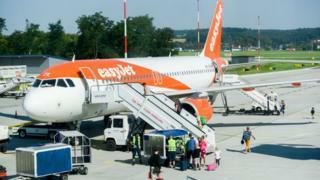 As a result, EasyJet said it was now more cautious over its outlook for the second half of its financial year. The airline has already said it expects to make a loss of around £275m for the first half of the year. EasyJet's shares fell almost 8% in early trading following the release of its trading update, which had originally been due for release on Friday. "We are seeing softness in both the UK and Europe, which we believe comes from macroeconomic uncertainty and many unanswered questions surrounding Brexit which are together driving weaker customer demand," said chief executive Johan Lundgren. Despite its caution, EasyJet said revenue per seat - a key measure for airlines - would be slightly higher in the second half of the year, while cost per seat would remain flat. Mr Lundgren said the airline was "operationally well prepared for Brexit", adding that "whatever happens, we'll be flying as usual". It has established EasyJet Europe, with headquarters in Vienna, which will enable EasyJet to continue to operate flights both across the EU and domestically within EU countries regardless of the Brexit outcome. Hargreaves Lansdown analyst George Salmon said the airline was being affected by issues out of its control. "Higher fuel costs are hitting profits and with Brexit potentially impacting travel regulations and currency markets, customers are understandably waiting for more certainty before booking trips away. "The group reckons demand will pick up later in the year, but a more pragmatic observer would say it's difficult to put a timeframe on when Westminster and the EU 27 will solve the Brexit puzzle." EasyJet's warning comes amid a tough time for the airline industry, with a combination of factors such as higher fuel bills and excess capacity in the sector contributing to its problems. Last week, Iceland's Wow Air collapsed.